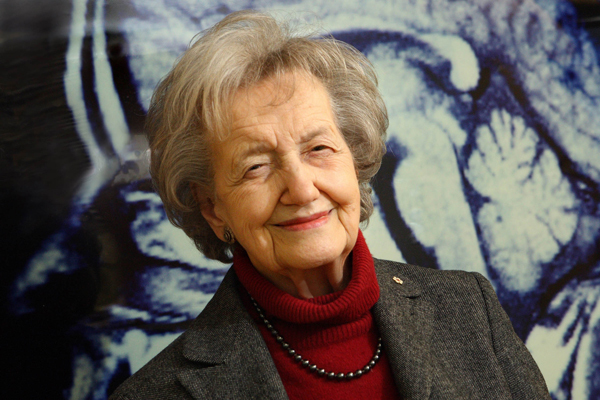 After nearly 60 years of groundbreaking work at McGill, neuroscience pioneer Dr. Brenda Milner won the $1M International Balzan Prize in 2009 for innovative non-traditional research. Shortly after arriving at McGill from her native England in 1950, Brenda Milner began a fateful 30-year research collaboration with a patient named Henry Molaison—a collaboration that helped establish Milner as a pioneer in the new field of cognitive neuroscience, which merges neurology and psychology. Following an operation to control his epilepsy, 27-year-old Molaison—who, until his death in December 2008, was publicly identified as “HM”—lost the ability to convert short-term memories into long-term. Although HM’s severe amnesia prevented him from recognizing Milner from one day to the next, she discovered he was able to retain certain kinds of new knowledge. Milner’s resulting demonstration of multiple human memory systems dramatically changed our understanding of how the brain works. Dr. Brenda Milner won the $1M International Balzan Prize in 2009 for innovative non-traditional research. JR: Has your career exceeded your expectations? BM: Enormously. When I started out, my ambition was always to feel that one was adding some small thing to human knowledge. But that in one’s lifetime it was going to take off in this amazing way and become such a huge and exciting field…no, I could not have possibly foreseen that. It’s immensely gratifying. JR: Every time you met with HM, you had to reintroduce yourself. How did it feel to work so closely, for over 30 years, with someone who couldn’t remember you? BM: Yes, this is frustrating. It’s only since HM died that I’ve really thought about this in any detail. One feels that one has lost a friend. He was always so courteous and pleasant. I don’t know what the dictionary definition of friendship is, but I think one’s idea of a friendship is that it’s something that’s reciprocal. And so suddenly we’re saying this isn’t necessarily the case, because HM doesn’t know us. Yet we feel, and definitely I feel, he’s a friend, no question. He was always saying how much he wants to be helpful, do anything he can for science. I always felt he was a friend when I came to see him, even though he looked blankly at me. It’s very strange. JR: Over your career, you’ve seen almost unthinkable leaps in brain imaging tools such as MRIs. What are your thoughts on how technology is changing neuroscience? BM: The huge step forward, and it was really quite shocking even to think that one might be able to do it, was being able to take psychology students or other healthy volunteers, and put them in these scanners and give them tasks to do, and see the brain active. We didn’t need to have brain operations done or, before that, wait until somebody died, to see it. It was quite intoxicating. Of course, if we had been able to do that from the beginning, we probably would not have learnt as much as we could have learnt from the patients. I suppose it was good to have to try to figure some of these things out in a more challenging environment. How good the work is, is a function of how good the question is. JR: So, how do you come up with a good research question? JR: If you were minister of science and technology or economic development—wait, I haven’t finished and you’re already cringing! BM: I’ve never had political ambitions! JR: Well, if that minister came to you and asked you what researchers need today, what would you say? BM: I actually said this to the Prime Minister in Ottawa a few weeks ago, that I really believe that we must be supporting basic science. There is a real emphasis now on translational research that has an immediate transferable value with no comparable growth in support of basic science, the science whose primary aim is to increase knowledge. It’s ironic, but all the translational work being done now is from basic science of the past. This is the thing I feel most strongly about. Brenda Milner’s research is funded by the Canadian Institutes of Health Research, the Metropolitan Life Foundation and the Natural Sciences and Engineering Council of Canada.